» Get faster in final cut pro -11 – Mouse analysis you down with FCP? The more you use your mouse, the slower you work. Some tasks are impossible to do without a mouse, but maximizing keyboard shortcuts is the clear path to speed. Keyboard shortcuts, key remapping, and droplet creation are all designed to reduce the number of steps required to do something. The difficult thing is trying to get feedback on what we have been doing inefficiently. Watching others edit can be a great help, but it only shows you things that they do quickly, not things that you do slowly. 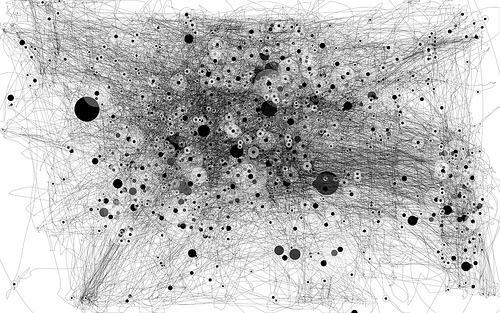 Enter io graphica It is a cool little piece of software that logs your mouse activity. When you move your mouse it will draw a thin black line. The longer your mouse sits in one position the line will turn into a dot and then a huge blob. Io graphica will run silently in the background while you edit. Turn it on and then crank out a few hours. Then take a peek. Provided you spent all (or most) of your time in final cut you can see a direct correlation between on screen actions and your window layout. If you want to you can take a screenshot and layer the two in photoshop to see how they line up. This info could be the final thing to help you move into 3 point editing, or it could help show you that you should really not use the pull down menu for copy and paste! This will definitely take some introspection and careful analysis, but it is one clear way to work on the actual mechanics of editing. It will also work on many different apps, try it in illustrator, photoshop or after effects. Hopefully this will show you room for improvement, and possibly point you to some new shortcuts! ~ by ross on June 8, 2010.